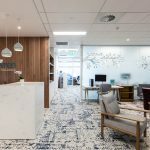 IA Design were engaged by the leading natural gas producer, Shell Australia, to design the national headquarters as a part of a new global branding initiative. This dynamic work environment is the first of its kind in the world, exhibiting leading edge technologies and infrastructure. Located in the Kings Square precinct, Shell House presents a dynamic, multi-purpose environment accommodating the needs of all staff – consolidating staff from three buildings into one central location. Shell House spans across multiple floors with devoted areas for flexible work spaces, staff training facilities, collaborative workspaces, speciality facility management areas and client interaction zones. One entire floor level has been devoted to a collaborative working environment which enables real time interactive links with the Prelude (FLNG) facility located offshore in the North West, off Western Australia. The design brief was driven by a comprehensive set of Shell design and space standards dictated by the global headquarters. IA Design’s involvement extended from the project definition phase through to design and practical completion. This process included the design of a pilot floor that provided a testing ground for design concepts that were later employed in the site. The IA Design team worked closely with local and international teams to collaborate these rigorous design standards to ensure the desired outcome was achieved. 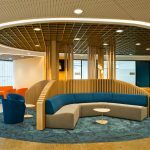 The finished environment met and exceeded Shell’s expectations, and the new Perth headquarters marks the first international location to adopt the revised design and space standards – setting the standard for global adoption.